New Windows + New Doors = New Cracks! Spring is in the air and it is time to start all those home maintenance jobs that you wish had been done before the winter. At this time of year many homeowners consider getting new windows to give their house a facelift and to improve insulation, not to mention adding value to heir property. 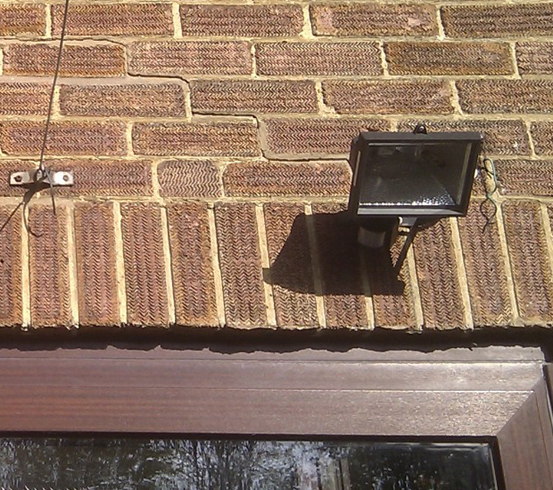 After the job is complete, many homeowners are settling back to enjoy their new windows when they notice cracking in the brick walls above - this common problem can be easily-solved by qualified professionals using quality Twistfix products. So what causes these cracks and how are they fixed? The key lies in the old frame which, to allow for the installation of modern double glazing, is removed, This frame doubled as an effective lintel, helping to support the brickwork above: without this frame, the masonry begins to settle onto the new frame which, generally made from uPVC, cannot handle the pressure and allows sagging of the lintel to occur, causing cracks. The problem also ooccurs with the fitting of new patio doors, over which there is significant weight of brickwork. Newman Building Solutions (NBS) are a structural repair contractor registered with Twistfix and their skilled staff often come across this problem. 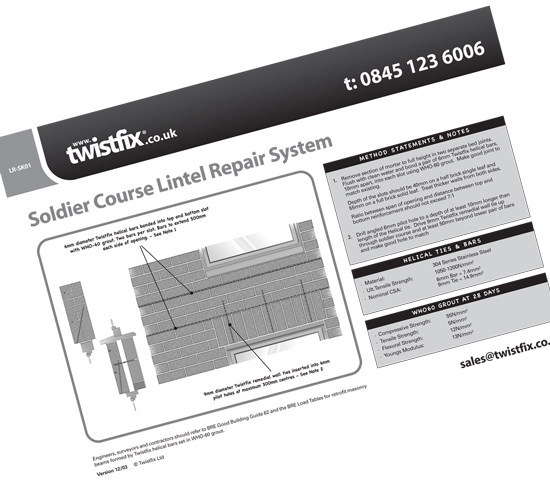 When they do, they reach instantly for the Brick Arch Repair Kit from Twistfix, which contains everything necessary to form new beams above failed lintels, soldier courses and arches that have weakened or failed. Steve Newman from NBS regularly purchases the product and spoke to us about using it. "Uniquely we can use BRE load tables to design the retrofit masonry reinforcement beams," he said, "a process that is incredibly accurate and offers a number of cost-saving benefits from reduced waste to increased productivity". He warned against inferior contractors, stating that: "Many competitors profess to be expert in this field despite them having no independent test data on the bar and grout combination that they use.” As NBS are so dedicated to rigorously-enforced high standards of practice across the board, Steve Newman was: “Surprised that surveyors and engineers allow such systems to be utilised without detailed analysis of the loads and third party test data verification." 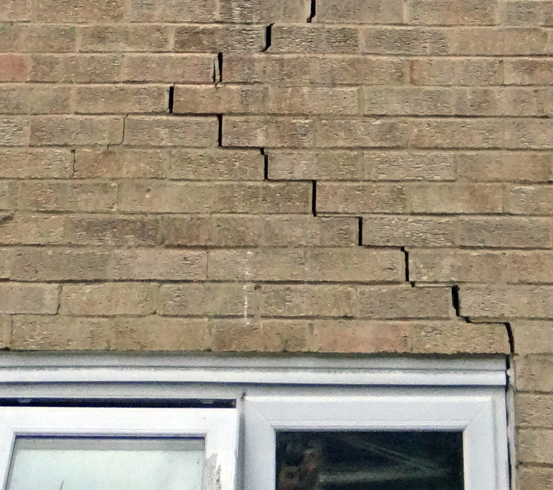 Masonry crack repairs must, by their very nature, be extremely robust and long-lasting. The Brick Arch Repair Kit from Twistfix contains helical bars, specialist masonry repair grout, tools and all the accessories you’ll need to achieve the most professional results - guaranteed. It even includes a handful remedial brick ties for pinning dropped arches and secured them to the reinforced brickwork above. Get all the information you need from our expert team by calling us today or chatting live online. Check out all the masonry rein­for­cement 'tech-specs' and our Brick Arch Repair Kit - get the job done right first time and before cracks above windows get worse. 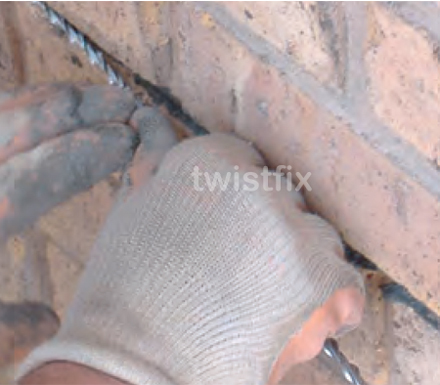 Choose Twistfix for all your masonry crack repair needs.